The first regional meeting of SABR members in the Upper Midwest took place in 1981. Four years later, the group formally organized itself as the Halsey Hall Chapter. By doing so, the organization was able to greatly expand its activities. The chapter takes its name from the longtime writer, broadcaster, and baseball ambassador. 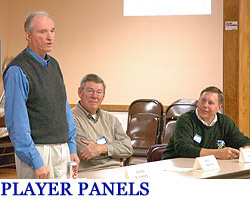 Semi-annual Chapter meeting, which include research presentations and a player panel. 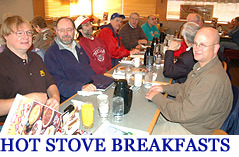 Mid-winter Hot Stove League meeting. 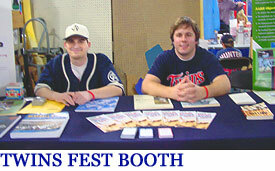 Attend Twins and regional baseball games with other SABR members. Chapter website with posted newsletters. In addition to regular events, there are other areas in which the Chapter gets involved. For example, in 1994 the Halsey Hall Chapter raised funds from ex-players and fans to erect a plaque marking the site of Lexington Park, the former home of the St. Paul Saints. In 1988, the chapter hosted the national SABR convention in Minneapolis-St. Paul. Chapter member Stew Thornley received the national Macmillian-SABR Baseball Research Award in 1987 for his research that culminated in the publication of On to Nicollet, the history of Nicollet Park, longtime home of the Minneapolis Millers of the American Association. Most of all, the Halsey Hall Chapter of SABR puts you in touch with	others, like yourself, who have a deep interest in baseball - for research exchange, scholarly discussions, or just plain someone to go to a ballgame with. As with the national SABR organization, there are numerous ways to participate. It's all up to you!